I’ve loved elephants my whole life and eagerly anticipated receiving this review copy. After reading this book, however, visiting an elephant enclosure at the zoo will never be the same for me. When Anju Loved Being an Elephant tells the heartbreaking and poignant story of a Sumatran elephant who is abducted at a young age, ripped from her family and friends, and sold to a circus. The story opens when Anju is about to board a semi-truck to another location. Her mahout, or caretaker, tells her it will be “a better place” but she expects to go to another circus or zoo. She daydreams about her childhood in Sumatra, about the lush jungle in which she lived, about the pine trees she and her best friend, Lali, would rub their backs upon, and about her herd-family. As she looks through the steel bars of the truck’s window onto the highway and the cars zooming past her, she thinks about the circus where she was forced to perform and of how she couldn’t make friends with other elephants because they were sold before she had a chance to form a bond with them. For years, she travels from circus to circus and then from zoo to zoo, her heart aching for another “elephant soul” with whom she can connect. And now she is on her way to another circus or another zoo, she fears. But is she? Since I don’t want to give away the ending, I will only say that at the end of this last journey she finds what she has been seeking her whole life. At the end of the book, the author provides four easy actions readers can take to help elephants as well as some facts about elephants. 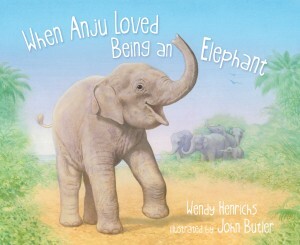 Anju, a fictional character, is based on the lives of captive elephants. Author Wendy Henrichs translates into age-appropriate prose how these creatures must feel when they are taken away from their native lands and lives, and artist John Butler translates life-like scenes from Anju’s life into warm color illustrations. Anyone at any age who loves elephants or wants to learn more about their lives in captivity will enjoy reading When Anju Loved Being an Elephant. We’ve checked this one out from the library twice – the first time I just read it but didn’t read it to my daughter but this last time we did read it to her. She found it very sad but I think the book is an important one. Thanks for the review. Sounds like a great book that we will definitely check out when my daughter is a little older. This sounds amazing (and heartwrenching). Thank you for the review. Heartbreaking story, thanks, for sharing this review. I love elephants, so sad to think of them being mistreated. Elephants have such good memories, I bet it truly is painful for them to be ripped from their home and family, like it would be for any human. Too bad humans think they are the center of the universe, and that only they have feelings. I’m glad for books like this that nudge at us, challenging our narcissism. What a great review. Thanks for sharing. I’m going to get this book and couple it with the book, An Elephant in the Backyard by Richard Sobol. This children’s book has a photo essay of one of the last villages in Thailand where over 80 Elephants roam freely and are treated with love. These two books will offer a great compare /contrast for my elementary age daughters to spark important conversations about their growing ethical outlook of the world beyond our home. Thank you for helping expand our cultural and ethical experiences. Mom J, thanks for the book recommendation! I will need to check it out. I simply adore elephants, and Andrea’s review brought tears to my eyes. An Elephant in the Backyard looks like another good one.